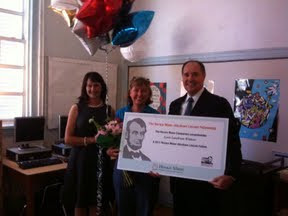 Congratulations to Ms. Lynn for winning an all-expenses paid trip to Illinois to study Abraham Lincoln! The trip is fully funded by Horace Mann Insurance. 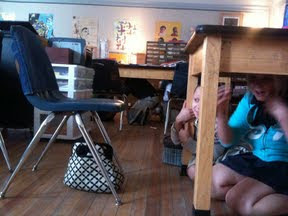 Today, students and staff a Ellis participated in the Great Central US Shake Out earthquake drill. Welcome back from Spring Break! I hope you had a great time and got a chance to relax before our last push towards to the end of the school year. I've been looking forward to this week for a really long time because YOU will become the teacher! On Monday, we will all pick one topic that we have studied this year (sorry, it will be a "close your eyes and pick out of the hat" type-of-thing). Then, you will spend the next few days planning a lesson to teach your classmates! Fun, right?! Don't be nervous, I will be there to help you every step of the way. 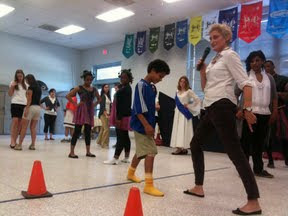 I also heard from Ms. Carol that the 6th grader's presentations skills have really improved! Mr. Brandon will also come to visit to show us some pictures from our trip to the waste water treatment plant! On Thursday, we will have a earthquake drill. This is the first time i've ever practiced what to do in the event of an earthquake, so it should be a very eye-opening experience. Finally, a friend sent me a picture she came across in a children's book that she was reading to her daughter. She thought the person in the book looked a lot like me! What do you think? 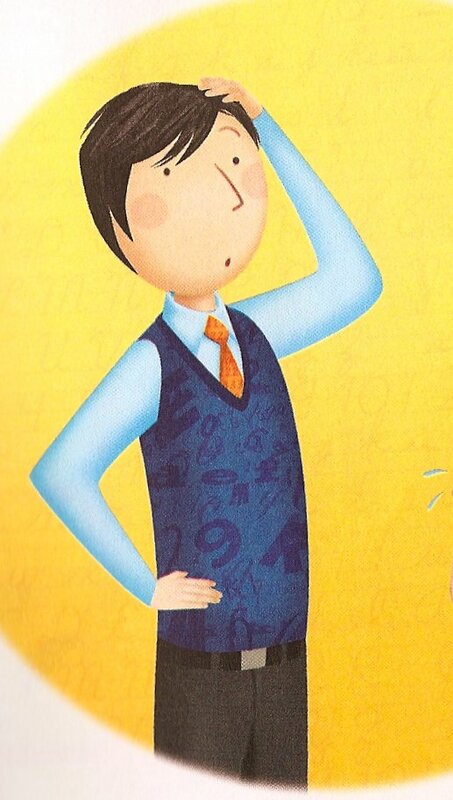 If you can tell me what book this picture is from, you will get a prize! Please have a safe and enjoyable Spring Break! I'll see you on Tuesday, April 25th. 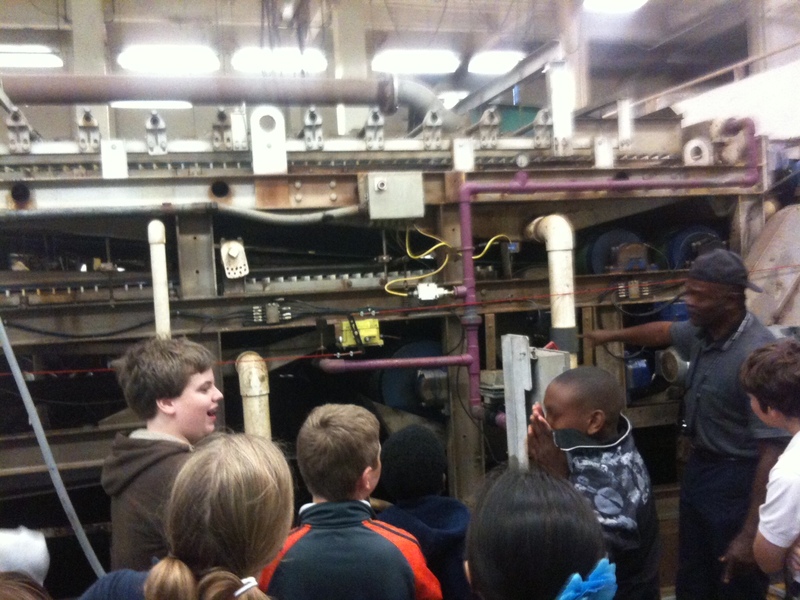 We had a great time today visiting the President Street Waste Water Treatment Plant. 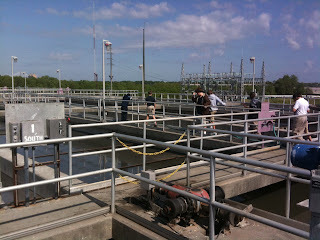 While there, we were able to see the entire process of influent dirty water become clean effluent water. Yes, it was a bit smelly and at times not too pleasant to look at. But, it's interesting to see how we take are of our natural resources. Special thanks to everyone at the water treatment plant for your hospitality, and to Mr. Brandon for organizing the trip. We had a great time today learning to salsa! Thanks to the Spanish club from Savannah Arts Academy for the great lessons! Don't forget to bring in your permission slip to attend our fieldtrip to the Presidents' Street Waste Water Treatment Plant on Friday. We will get to see first hand how dirty water is cleaned and sent back out into the world. Here is a great website about the plant that you should check out before our visit. Are you ready for the last week before spring break!?! We have a lot to do before we enjoy some time off. We will be focusing on finding the volume of pyramids and cylinders in math. Mr. Brandon will be here to review waste water treatment, and then we will take a field trip to the Presidents' Street Water Treatment Plant on Friday. Be sure to get your permission slip signed and returned to me. We will also be taking the last of our quarterly assessments. Remember, these tests help me plan our studies for the rest of the year. Finally, we will be working on our sections of "Charles Ellis Presents: The Story of Language". Wow, we have a lot to look forward to! Have a great week! Last Day of Morning Tutorial. If you attend morning tutorial, please remember that Thursday, April 14th is the last day of the program. I've really enjoyed our math mornings we've spent together! 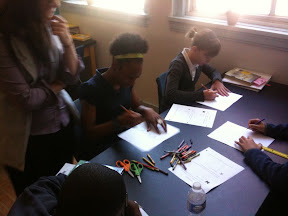 Today, Ms. Lisa presented a lesson about symmetry that is found in plants and animals around us. Can you name two types of symmetry we studied? Welcome to the First Week of April! It's the first week of the last term of the school year! Are you ready for a good week? Like always, we will be busy. In math, we will finish up our studies on volume. In science, we will spend some time talking about fossil fuels. Mr. Brandon will be here to give you a lesson, too. Your "Natural Resources Bingo" choice sheet is due Friday. You will also have a test on natural resources on Friday. Starting Monday, we will be taking the quarterly assessments. You will have one each day this week. We will use these assessments to find strengths and areas of need so we can plan our studies for the remainder of the school year. Be sure to eat a good breakfast each morning and bring a bottle of water to keep your brain hydrated. HERE is an interesting article by Joshua Gowin that explains why your brain needs water to function properly. Parent/Teacher conferences will take place over the next two weeks. If you forget your time, or need to reschedule, please let me know ASAP. Remember, students are always welcome to come to conferences, too! Finally, please return any order forms/money by Thursday if you are planning on purchasing any Scholastic books. Keep in mind, the Book Fair is also taking place this week in the library. Books, books everywhere! I hope you had a great weekend. I'm looking forward to spending the week with you at Ellis! Good news! We have access to a great online CRCT practice test. The practice tests are created by the same people who make the actual CRCT test; so they know what they are talking about when it comes to test preperation. Click HERE to access the test.